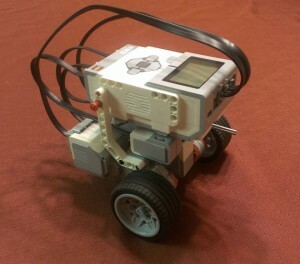 Some time ago, John Burfoot posted an EV3 build called The Harvester, a quick robot designed using just 49 pieces. I really liked the concept, so I played around with it a bit. 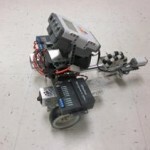 The result was a robot with 2 motors, 3 sensors, and only 37 pieces (the sensors, motors, brick, and even the wires). While the Harvester uses the color and ultra-sonic sensor, Optimal Prime uses the gyro, touch, and color sensor. 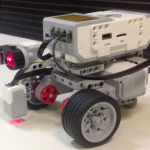 They each show how to use different parts from the EV3 education kit and are built in different ways. 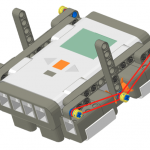 Both can be used as reasonable starting points for a more complex FLL robot with more sensors or motors mounted on.